Simplify your drive train with the Hope 11-speed Cassette. This wide range cassette is machined from two solid billets for added strength and durability. 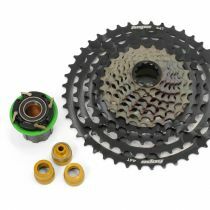 Suitable for both Hope's Pro 4 and Pro 2 EVO hubs, this cassette comes with QR, 12mm and X12 drive side spacers included to suit Hope's own specific freehub/cassette setup.